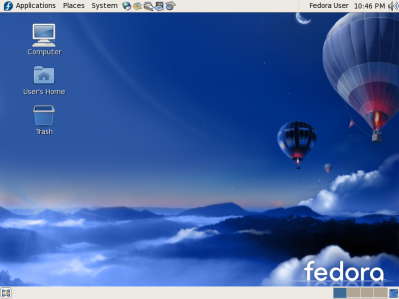 Update: Nov-7,2007: Fedora Linux 8 has been related and available for download here. Fedora 7 has been released. The Fedora Project is a Red Hat sponsored and community supported open source project. Its goal is the rapid progress of free and open source software and content. It offers cutting edge softwares for desktop usage. The latest version of the popular Linux distribution has a lot to offer users and developers. => This release features GNOME 2.18 and KDE 3.5.6. => This release integrates Kernel-based Virtual Machine (KVM) technology with Fedora’s graphical virt-manager and command-line virsh tools. KVM provides a hardware accelerated virtualization solution, and users have a choice between KVM and Xen, along with Qemu, in this release. => In this release, the performance of yum, Pirut, and Pup have been significantly improved. => This release features integration of a new FireWire stack in the kernel for more robust device handling. => Fedora now includes improved power management through implementation of dynamic ticks in the kernel. => See Fedora 7 release notes. => Use Live CD (700M) if internet connection is slow or you just want to see how Fedora works. You can install fedora from Live cd. dd is a perfect tool for copy a file, converting and formatting according to the operands. dd command works on Linux and a Unix-like system whose primary job is to convert and copy files. It can create exact CD-ROM ISO image or create a new CD/DVD iso image. This is useful for making a backup, as well as for hard drive installations, require a working the use of ISO images.